Make sure the front quick-release is tight. It's a source of creaking. All the new-fangled parts and materials on today’s bikes have drawn me into a long and painful learning process when it comes to finding creaks, clicks, and squeals. Finally, after a couple of months trying to figure out a clicking noise that happened only under load, I found the culprit — a slightly loose front quick-release. How I found it is revealing. I put one foot against the left crank arm and pressed on it while holding the bike with both hands at seat and handlebar. Suddenly I heard the tell-tale click, only it was in the front of the bike and not at the bottom bracket as I thought! I tested the quick-release and sure enough it was just a tad loose. After tightening, I took the bike for a spin. No more clicking. 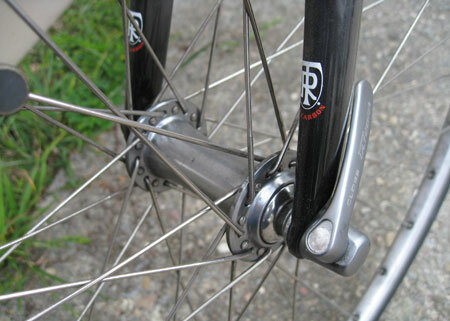 Dissimilar metals (aluminum dropout and steel quick release) don’t help matters. Now I’m not saying all clicks are caused by the quick-release. In my situation the bike is only months old, so it would be odd if something were amiss with parts. Read on for more possibilities. I had found Jim Langley’s treatise on squeaks and creaks, but didn’t read it carefully. He mentions the quick-release. Jim should know. He was the technical editor at Bicycling Magazine, 1989-99. Now what about this occasional annoying bird chirping sound? It’s not the chain or tension rollers. I replaced the chain and re-greased the rollers. I’ll figure it out…eventually. This entry was posted on March 20, 2012 at 6:57 pm and is filed under Repair. You can follow any responses to this entry through the RSS 2.0 feed. You can leave a response, or trackback from your own site. One time I had a terrible creak that I was SURE was my bottom bracket… But was actually a single loose chainring bolt. I figured it out by noticing that the noise didn’t occur when the chain had been dropped.